The DM4600 radios are very good indeed – they do a lot of things and perform well, but here’s one thing that bugs a lot of people … where is the audio out jack ? Well, of course, there isn’t one, sorry about that. remember these are not designed for Amateur radio use, it’s PMR gear, and in the age old spirit of Amateur radio, we adapt these commercial sets to our own use, and adding an line out jack is a simple 10 minute job.. if you already have the parts. 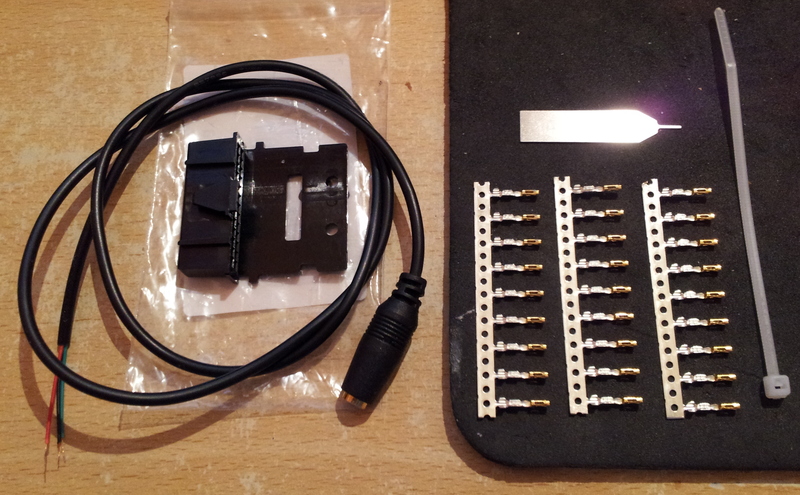 I hope you have studied the great article HERE by our very own Mot Orious here on MBARS, about building a little audio preamp for use with these sets too – and you will have noticed the nice selection of pins on the back of the DM4000 and DM3xxx sets. This little lead gives you fixed volume line-level audio out from the rig, whatever the front panel volume control is set at. That way we don’t have to drill holes in the set and put a 3.5mm socket in line with the speaker to silence the set when used on headphones ! I think this actually gives more control.. we can record or stream it around the house or into other audio equipment, provided they have line inputs. i dont know the actual output impedance from the accessory socket, but i imagine it’s reasonably high, and the fixed output it provides, easily drives some high impedance ear-buds form a mp3 player type device, with enough audio for comfortable listening without the need for one of those cheap in-line headphone amps off Ebay, or just making one with a op-amp. 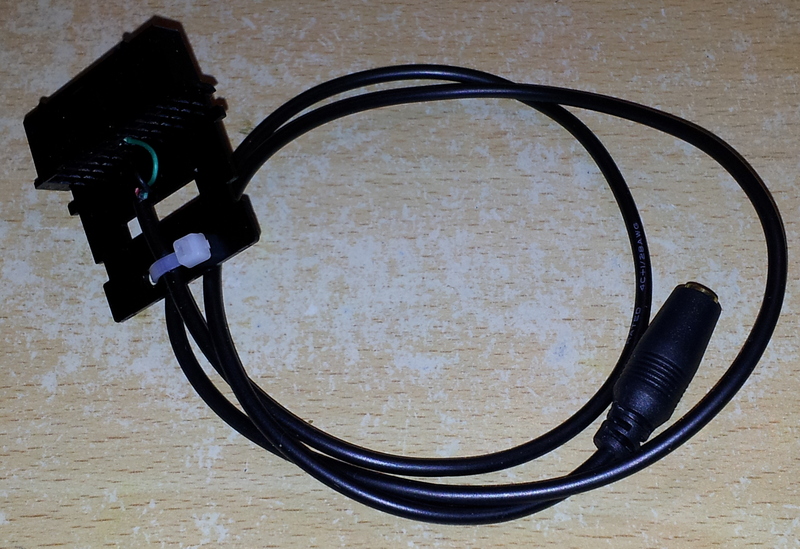 First thing you need is the accessory connector… it’s pretty easily available, Motorola part number PMLN5072A and they are available on Ebay for £6 or £7 – (just paste that part number into the Ebay search box) or maybe a few pounds more, grab one off your local friendly Motorola dealer. Get the Ebay ones while you can is my suggestion. Also get a 3.5mm in-line jack socket too… (or whatever plugs into your amp) we used 3.5mm jack because the friend i made the first one for wanted to use headphones, I ended up making one for myself too. 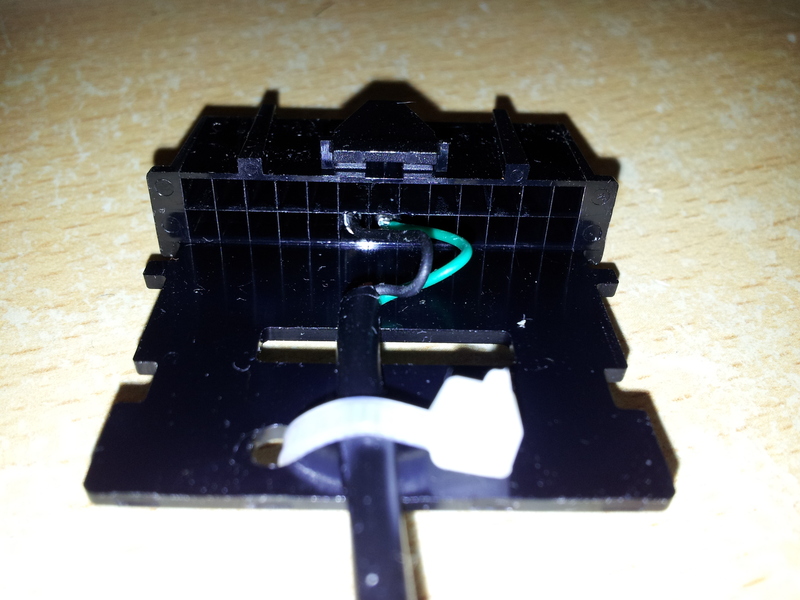 Here are the parts you need.. on the right are the three metal strips you see are the pins, and that small shiny rectangular thing above is the pin removal tool, should you need it, on the left you see the black plastic main shell, and the 3.5mm socket lead around it. Prepare the 3.5mm cable – i used 2 of the 3 wires in the lead, as it’s a mono set, i only need one channel, so with a DMM check the tip and sleeve of the socket – you can’t really get a meter probe into the socket, so as i bought a headphone extension cable, i snipped the unneeded plug end off and plugged that in the socket instead .. with the added bonus that the wire colours will be the same. I tinned the wires and fitted the pins..
Then, after nipping the pins up with a pair of small long nose pliers, i heated the pins to reflow the solder that i applied when tinning the wires for added strength. Now it’s time to decide where to put the pins in the shell, so i referred to Mot Orious’s pinout HERE and it’s pin 14 and pin 16 we are interested in today..
thats these two yellow arrows – this photo is just looking straight into the back of the DM4600 connector – with the set the right way up. 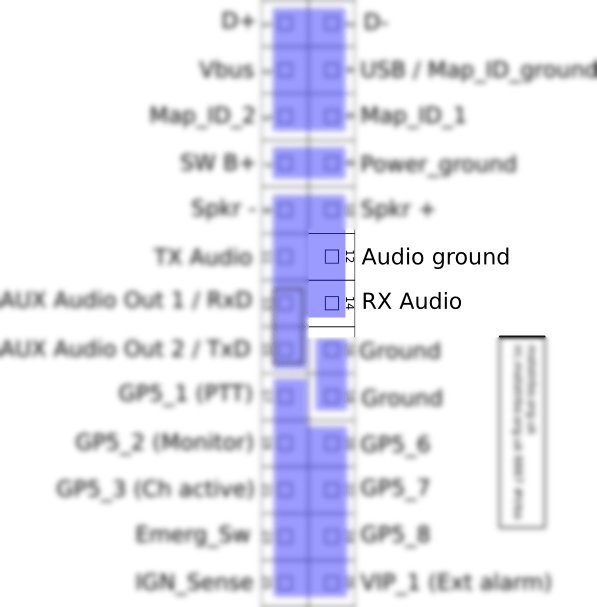 So, Pin 14 is the main RX Audio out pin (signal) and pin 16 is a handy ground right next door. Note the way the pins are actually numbered here, it’s not the same as the anti-clockwise numbering you find on ICs.. oh deary me no. Instead, the numbering jumps ‘across’ each time, zig-zag like instead. Pin 1 and the corner pins are numbered already on the socket, but tiny raised black numbers on black doesn’t exactly stand out too well, so lets be doubly sure here, and it doesn’t even hurt just to double check with a scope. which is what i did, this is what FM noise looked like out the back of my VHF DM4600 with the squelch open. Right .. now we’re cooking, so make sure the signal doesn‘t change on our pin 14 when we turn the main rig’s volume down. Anyway, you’re now ready to insert the 2 pins into the shell. Choose the pin that is connected to the ‘tip’ and insert that into pin 14 of the shell, making sure that the ‘barb’ on the pin faces upwards, as this will lock the pin into the shell, do the same for pin 16 too, and that the pins are locked into the shell ok, when you are done, leave a little bit of slack cable, and tightly apply the cable tie. 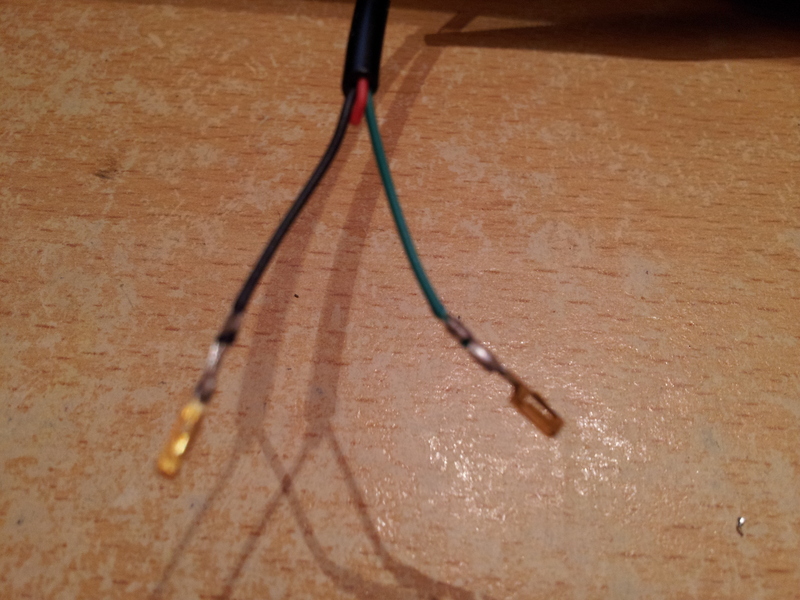 and now your Motorola audio-out lead is done. Obviously it’s a very simple job, and is much the same as making the programming cable as Mot Orious detailed here, it’s probably going to be quite handy for some folks, and you can hook it to the car audio system if you like or what have you. Hi Ron apologies for the delay in replying, i have been rather busy lately… i moved QTH, but I guess i could make a few of these up for people, they’re simple enough to do, and would be about a tenner each, in a couple of weeks i should be set up make a couple. If you can email me in a couple of weeks, or join the site i will be able to message you when i have done a couple. If i want to connect dm4600 mobile with slr5500 repeater to link purpose in Digital mode what will pin config? please help me to know. can i get that facility?